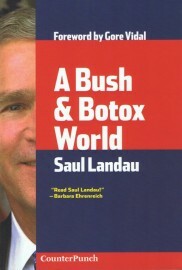 With a foreword by Gore Vidal, Saul Landau provides insight into the culture under which the Bush White House operated. It uses Botox as a metaphor for both the rapid technological change of the globalised world and its superficiality. Landau gives insights on modern Vietnam, anti-Castro terrorists, American corporate executives and African-American kids on east Oakland's streets in this romp around US culture. Between the prose pieces, Landau inserts pithy poems on aging, computers and a concert in Istanbul. He takes readers back to the horrors of the 1976 assassination of his friends and colleagues, Orlando Letelier and Ronni Moffitt on Washington, DC's Embassy Row and into the blood-filled streets of Falluja. The allegorical essays on Hearst's Castle and the Salton Sea stand as both insights into the contemporary world and warnings for the next generation. Saul Landau was a Fellow and Board Member of the Institute for Policy Studies and board member and co-founder of the Center for Cuban Studies. Landau has made fifty films on hot issues. He won the Letelier-Moffitt Human Rights Award, the George Polk Award for Investigative Reporting, and the First Amendment Award, as well as an Emmy for "Paul Jacobs and the Nuclear Gang." AK Press & CounterPunch, 2007.